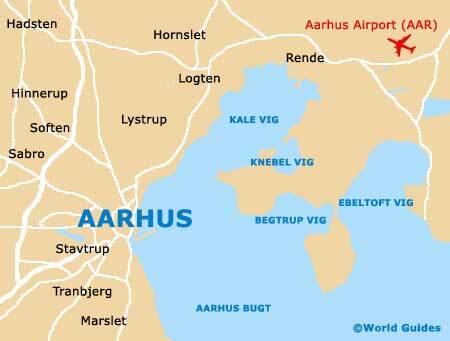 The best way to get an overview of Aarhus is to enjoy a sightseeing tour, where you will learn more about the city's tourist attractions and most notable buildings. Guided bus tours are especially popular and led by experienced multilingual guides, giving tourists tantalizing glimpses of the main attractions, along with detailed tours of the Aarhus Cathedral. Away from the historic monuments and landmarks within the city and situated on the outskirts of Aarhus are a series of sandy beaches, which are always buzzing during the sunny Danish summers. The northerly Bellevue Beach is amongst the most popular of these coastal attractions, along with the more southerly Moesgard Strand, which is around 8 km / 5 miles from the actual city centre. Windsurfers will find the most suitable stretches around Aarhus Bay, Risskov and Marselisborg, while for those simply looking for a stroll, there are many peaceful beech forests around Marselisborgskoven. The impressive and rather imposing Aarhus Cathedral is actually the longest in the whole of Denmark and features a lengthy nave stretching for almost 100 metres / 328 feet. Construction of the actual cathedral commenced at the very start of the 13th century and lasted for 100 years, when it was finally inaugurated. The 15th-century saw some renovation work and the cathedral's original Romanesque architecture was transformed into its present-day Gothic-style appearance. 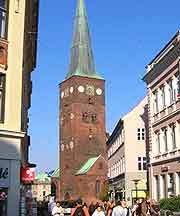 Apart from its length, Aarhus Cathedral holds a number of additional Danish records, including the church with the largest number of frescoes, the biggest pipe organ and the tallest tower. The carved, panelled triptych is a particular treasure and is amongst the country's most important medieval pieces. Featuring European architecture at its very finest, the Musikhuset is the city's acclaimed opera house and is worth a look for its exterior alone, while those lucky enough to enjoy a performance inside will be blown away by its wonderful acoustics. The Musikhuset dates back to the early 1980s and stands next to the ARoS Kunstmuseum. Designed by famous Danish architect Arne Jacobsen, known for his modernist structures, the Arhus Radhus was completed in 1942, with its rather austere and functional appearance causing much controversy throughout the city. The City Hall is topped with a tall, rectangular clock tower, which seems to be surrounded by forgotten scaffolding. One of the most notable modern landmarks within Aarhus, the exterior of the concrete-based City Hall has been clad with dark, Norwegian marble. Between June and September, afternoon guided tours are available on weekdays, and it is even possible to take a lift to the very top of the clock tower, where the views across the city and well worth bringing your camera for. If you have children who are beginning to become a little tired of all the historical landmarks and museums within Aarhus, then the Tivoli Friheden Amusement Park is perfect for a complete change. 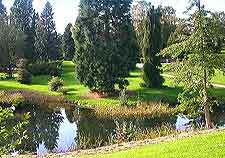 Situated around 2 km / 1.5 miles to the south of the actual city centre, the Tivoli Friheden is especially close to the woodlands of Marselisborg. 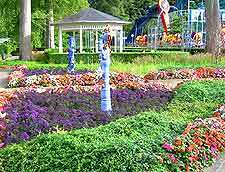 Attractions within the park include many popular fairground rides, together with regular clown shows, landscaped gardens with pretty flower borders, and plenty of eateries and fast-food restaurants. There is even a small casino area for adults who are partial to slot machines. One of the most easy to spot landmarks within Aarhus, the Telecommunication Tower can be seen for miles around and dominates the city's skyline. 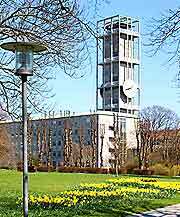 The tower is around 325 metres / 1,066 feet and was erected in 1956, and has been Denmark's tallest structure ever since. Famed for its creative use of concrete, the tower itself is supported by wires and transmits radio and television signals to the whole city and beyond.